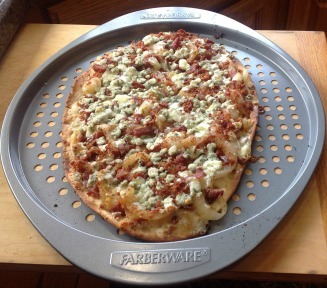 For years our customers have used pieces of St. Paul Flatbread to make their favorite pizzas. Spread some tomato sauce and garlic add your favorite toppings and eight minutes later you have a fresh pizza. (400 degrees). We have taken our customers suggestions one step further. We now make jazz or pizza bread. It has a slightly thicker texture that is made specifically for pizza sauces. You can purchase Jazz or Pizza Bread by the 1/2 dozen.